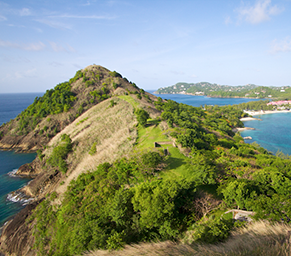 Visiting St. Lucia without sailing around it is like missing a chance of exploring the local way of life. The sea will give you whole new perspectives, and St. Lucia is rich with natural beauties, ranging from protected coast with breathtaking beaches, the impeccable National Rain Forest to the famous two volcanic mountains that rise from the waves and go into the sky, Les Pitons. The island has a soul, and if you take your time and visit the Sulphur Springs and the Diamond Falls, be sure that it will get under your skin and stay there. Sailing away west to the coast of Rodney Bay will show you beauties only nature can make, and then you’ll understand why movies as Pirates of the Caribbean were taken here. 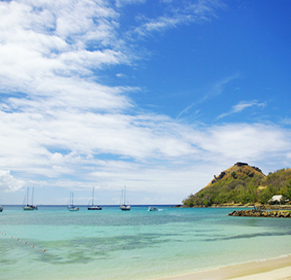 The Pigeon Island National Park will offer you a mix of historic heritage and amazing beaches. Leave the night for a visit of a local restaurant and enjoyment in the unique combination of French and British dishes. Reserve the second day to reach Soufriere, beautiful town on the west coast of the island. 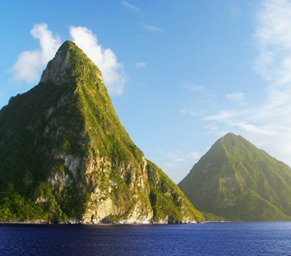 In a relaxing mood, while sailing with easiness, you will enjoy the beauties of the famous landmark of St. Lucia, Les Pitons, twin mountains rising from the sea. Don’t miss to visit the exquisite Anse Chastanet beach, blessed with unusual black sand and perfectly clear blue water. After a day of relaxation set to return to Marigot before the sun goes down. Second day and sailing south will lead you to the unique Anse Chastanet beach, where you cannot go wrong, choosing to relax on black sand beach or snorkel and see some amazing underwater life. The afternoon is reserved for a fabulous stay at the Jalousie Plantation Resort for the trend seekers or the snorkeling lovers can get to know the amazing scenery that Coral Gardens can offer, above and below water. If you feel like enjoying the night, under the stars, start with a sunset and drink at the Rum Shop. And if you want romance to lead your way, dinner at Dasheene Restaurant will treat you with a once in a lifetime view of the Caribbean, enriched with the background of the tall twins Les Pitons, just above you. 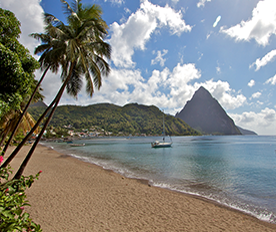 Sailing to Soufriere will bring you closer to the most beautiful attractions of St. Lucia. Intense few hours will show you the volcano, the Sulfur Springs, the Diamond Falls and the Botanical Gardens. Relax a bit from all the excitement on the quiet beach of Ance Cochon, or for more adrenaline rush go snorkeling and enjoy the company of turtles, trumpet fish, moray eels, octopus, squid and much more. End the exciting day with tranquil sailing to Marigot before sunset. Follow the charter and boat of your choice from the left column to the right and under the season and number of people to find your charter rate. Rates are per person. Holidays: Only the Basic Yacht Line is available during the holidays with a 2-night charter minimum.